Wife of the Governor of Lagos State, Mrs. Bolanle Ambode (middle); mother of the first baby of the year, Mrs. Basirat Adegbesan (2nd left); father, Mr. Wasiu Adegbesan (left); Commissioner for Health, Dr. Jide Idris (2nd right); Special Adviser to the Governor on Primary HealthCare, Dr. Olufemi Onanuga (right) and Medical Director, Lagos Island Maternity Hospital, Dr. Muyiwa Eniayewun (3rd right) during the presentation of gifts to the first baby of the year, born 12:00am, weigh 3.7kg, at the Lagos Island Maternity Hospital, on Tuesday, January 1, 2019. Wife of the Governor of Lagos State, Bolanle Ambode, has restated her call on pregnant women in the State, to patronise government health facilities for a safe delivery and to always immunise their children against killer diseases. 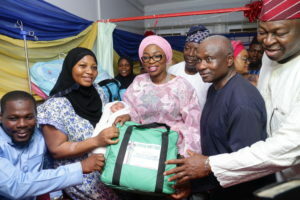 She made the call at the presentation of gifts to the first baby of the year born in Lagos State at the Island Maternity Hospital on Tuesday, noting that huge government expenditure on infant and maternal health infrastructure, could only be justified by commensurate use of the modern facilities by women, their babies and the children. 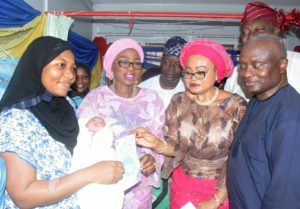 Mrs. Ambode, while congratulating parents of the first baby (a boy weighing 3.7kg) born exactly at midnight on January 1, 2019 to Mr. and Mrs. Adegbesan, at the Lagos Island hospital, said that government’s efforts at stemming maternal and infant mortality would be slow in materialising, if expectant mothers do not go to the centres to use the facilities. Wife of the Governor of Lagos State, Mrs. Bolanle Ambode, carrying the first baby of the year (2nd left); mother of the first baby of the year, Mrs. Basirat Adegbesan (left); Commissioner for Health, Dr. Jide Idris (2nd right) and Special Adviser to the Governor on Primary HealthCare, Dr. Olufemi Onanuga (right) during the presentation of gifts to the first baby of the year, born 12:00am, weighs 3.7kg, at the Lagos Island Maternity Hospital, on Tuesday, January 1, 2019. According to her, “I wish to note that Lagos State Government has continued to strengthen the health sector with the provision of neonatal care units, equipment and resources to our State hospitals, to enhance the quality of maternal and child care services in our State”. “The workers in the PHC and General Hospitals are committed and determined to provide quality care, but you have to go there and use the facilities. Mother and Child Centres are also being located in nearly every neighbourhood of the State for excellent infant and maternal health care delivery”, she added. The First Lady urged mothers to ensure they complete the full course of immunisation for their children, to prevent childhood killers like measles, diarrhoea, pneumonia, tuberculosis, tetanus and hepatitis, saying they must avoid the use of contaminated water and poor sanitation which could also contribute to childhood mortality. Wife of the Governor of Lagos State, Mrs. Bolanle Ambode (2nd left), with Hon. Federal Commissioner, National Population Commission, Mrs. Abimbola Salu-Hundeyin (2nd right), presenting the birth certificate to mother of the first baby of the year, Mrs. Basirat Adegbesan (left) during the presentation of gifts to the first baby of the year, born 12:00am, weighs 3.7kg, at the Lagos Island Maternity Hospital, on Tuesday, January 1, 2019. With them are Commissioner for Health, Dr. Jide Idris (right) and Medical Director, Lagos Island Maternity Hospital, Dr. Muyiwa Eniayewun (middle) and Special Adviser to the Governor on Primary HealthCare, Dr. Olufemi Onanuga (right behind). She also commended the National Population Commission (NPC) for registering newborn babies at Lagos hospitals, urging parents to always cooperate with the agency for accurate data compilation. 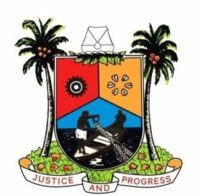 Also speaking, the Commissioner for Health, Dr. Jide Idris, said the Ministry placed much emphasis on efficient and qualitative healthcare services, adding that with the planned implementation of the Lagos State Health Insurance Scheme this year, more Lagosians would have access to improved services and better care. Idris assured that the State government would continue to stimulate the required quality of health service delivery that is poised to address existing health gaps and even new challenges that might emerge in the future. While emphasising that the health insurance scheme was compulsory, the Commissioner disclosed that 5,000 private healthcare providers had been registered for the scheme to complement the government’s efforts. 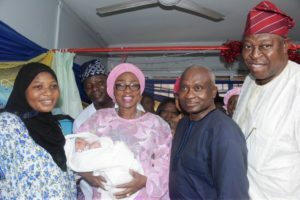 Similarly, Special Adviser to the Governor on Primary Healthcare, Dr. Femi Onanuga, while presenting gifts to the two set of babies born in the early hours of January 1, 2019, at Randle General Hospital, Surulere said as part of the drive to improve access to healthcare services, the State began the renovation of Primary Health Centres, PHCs across the state to meet the growing demand in various Local Governments and Local Council Development Areas. “This is geared towards promoting health and reducing the burden of diseases that hamper economic and social relevance. We are committed in our quest to reducing maternal mortality rates and neonatal/infant mortality by ensuring the availability of maternal and child services, skilled workforce and promoting partnerships with the Private Sector, locally and internationally,” he said.